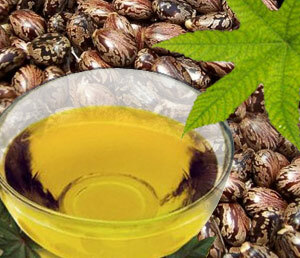 Castor oil is a natural derivative of seeds or beans from the castor oil plant. This oil is typically thick and either completely devoid of color or a pale yellow hue. Historically, castor oil has been used in many areas of the world for the purposes of providing relief from a variety of health conditions. Castor oil can also be used to provide a number of health benefits to hair. Due to the rejuvenating properties of castor oil, it can be used to help stimulate the growth of hair. This is accomplished through the increased circulation of the scalp, which improves the flow of nutrients to your hair. Since castor oil has a thick consistency, it can be mixed with coconut oil or olive oil in a half and half ratio. Part hair into sections and apply the oil mixture to each section until all of your hair is covered. Wrap hair for between three to eight hours. Wash as usual. This should be done three to four times per week for several weeks. Castor oil can also be used to give your hair a richer and darker hue. The humectant effect and nutrients of castor oil can help your hair to retain needed moisture, increasing its dark color. Use a pea-sized amount of the oil and mix with your regular leave-in conditioner. Distribute evenly throughout your hair. Due to the castor oil's ability to provide your hair with a protective coat along the hair shaft, it can be used to make your hair smoother and even reflect more light. To make your hair shinier, use castor oil as a hot oil treatment or conditioner once weekly. Make sure you do not use it too often or you may experience an oily scalp. A variety of causes can contribute to hair loss, including an unhealthy scalp or weak hair. Castor oil can be used to restore strength to your hair, but also offers anti-fungal and anti-bacterial properties that can prevent such problems as piedra, ringworm, and folliculitis. In addition, castor oil can also help to inhibit the growth of fungus and bacteria on the scalp that can make it unhealthy and lead to hair loss. To treat hair loss, apply castor oil to the scalp a minimum of twice weekly for at least 30 minutes prior to showering. Castor oil is known to help keep split ends under control when used as a conditioning treatment. This is due to the many nutrients contained in castor oil, including vitamin E, omega-6 fatty acids, and essential amino acids that can help to penetrate dry and damaged hair. To prevent split ends, carefully mix castor oil with any light oil, such as jojoba or olive oil, then smooth onto your hair, and distribute it evenly. Castor oil is commonly contained in many hair products due to its known ability to seal moisture in the hair. Apply castor oil after moisturizing used a water-based product to create a long-lasting seal. The germicidal and fungicidal properties of castor oil make it ideal for treating dandruff. Apply directly to dry areas of the scalp prior to shampooing your hair. The omega-6 fatty acids in castor can help to prevent your hair from becoming too dry. Regular use of castor oil may also help your hair to grow thicker. It is best to use unrefined castor oil as a hot oil treatment or scalp massage in order to stimulate hair growth. Leave in your hair overnight and cover it with a plastic shower cap for maximum penetration. Wash thoroughly the next morning.